How can I get the user's phone number in Autopilot? Autopilot sends the user's phone number as a parameter (UserIdentifier) of the Task's HTTP Callback. Is it possible to access the user's phone number as a variable of the Actions JSON in the Actions Bin? Unfortunately not at this point. If you need the user's phone number you have to configure the Task with an HTTP Callback and get it as a parameter of that request in your application or Twilio Function. Can Autopilot initiate outbound calls? Autopilot itself does not initiate outbound calls, but you can use our Programmable Voice API in combination with Autopilot to have Autopilot handle the call. 1 ) Make an outbound call using our Programmable Voice Calls API. You can learn more about making outbound calls with this tutorial. Copy Autopilot's Programmable Voice Url and use that as the Outbound call Url parameter. 3) Make a call. This way when you make a call via API, as soon as it is answered it will point to Autopilot to handle the call. Can I use Autopilot with Studio with Voice? Yes, you can. However, we don't have a Studio widget yet so please follow the steps below to set up Studio and Autopilot for Voice. 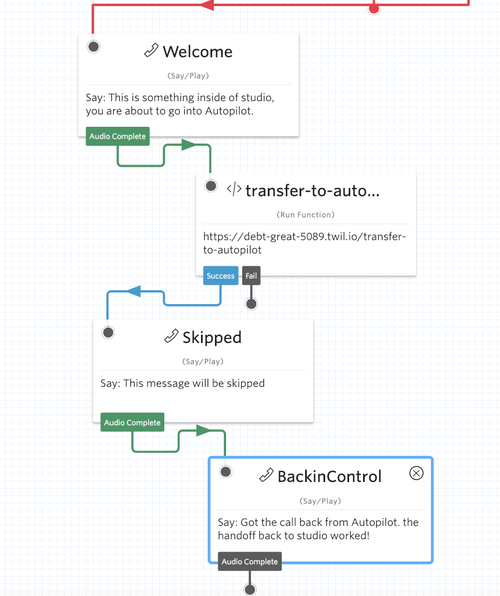 To send a call from a Studio flow to Autopilot you need to have a Twilio Function widget that redirects the call to Autopilot. We'll walk you through step by step. 1) You need to add a Say/Play Widget, a Function Widget where you redirect the call, a Play/Say that will be skipped, and a Play Say where the call will land when it is handedoff back from Autopilot. Call the Function widget transfer-to-autopilot. 2) Open a new tab and go to the Twilio Functions section. Then create a new function with a Blank template and call it transfer-to-autopilot with path: transfer-to-autopilot. 6) Go back to Studio and hit reload. Go to the transfer-to-autopilot function widget and select the "transfer-to-autopilot" function. Then we need to pass the CallSid to the function so that the function can modify the call. Go to 'Config' on the right-hand side. 7) Point a number to your Studio Flow if you haven't done so yet and give it a call. Once you get to the transfer-to-autopilot widget you should be transferred to your Autopilot Assistant! 1) Go to the Autopilot Console and select your Assistant. 4) Replace your AccountSid and FlowSid on the URL. The transfer-to-autopilot function cannot be the first widget right after the call trigger because we can not modify a call that has not been answered yet.